I’m so thrilled to be sharing my first post on Feeling Stitchy! I’ve been a reader of the blog for a long time and it’s very exciting to now be a part of it. I spend a lot of time stitching, but there are so many stitches I've never mastered, or even tried. So I’m going to work my way through an encyclopedia of stitches, learning and teaching you as I go! Starting, well, now, I’ll share a quick how-to for a new stitch on the first Saturday of every month! You’ll notice I may not always do things the traditional way, but I like putting my own spin on things and making the stitches work for me. For my first post I started with an easy one- The Back Stitched Chain Stitch! This is essentially just a combination of those two stitches, so I’m guessing most experienced stitchers will be able to jump right in! I’m using contrasting colors of thread (stranded cotton) so you can easily see the two different parts. 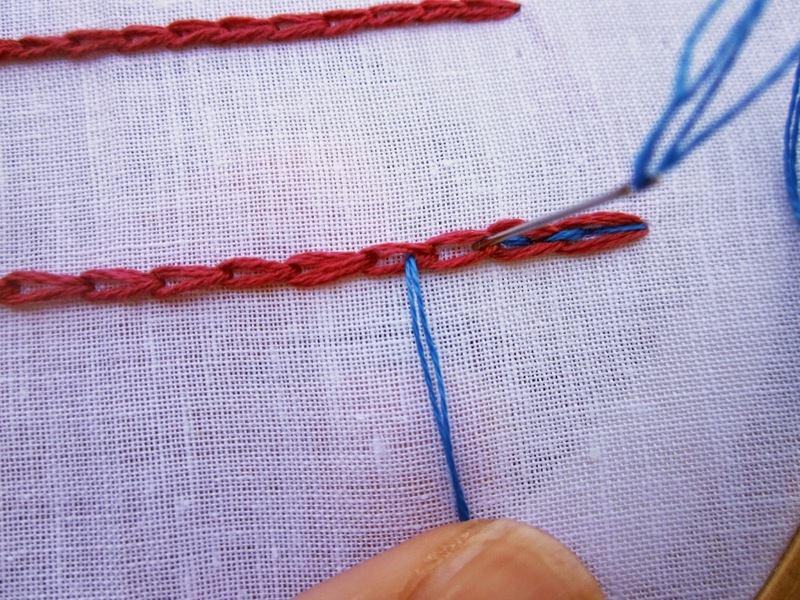 Start by making a chain stitch across your fabric. I actually work chain stitch a little differently than most (it’s backwards! ), which I’ll explain below. If you like your way, just skip to the next section! 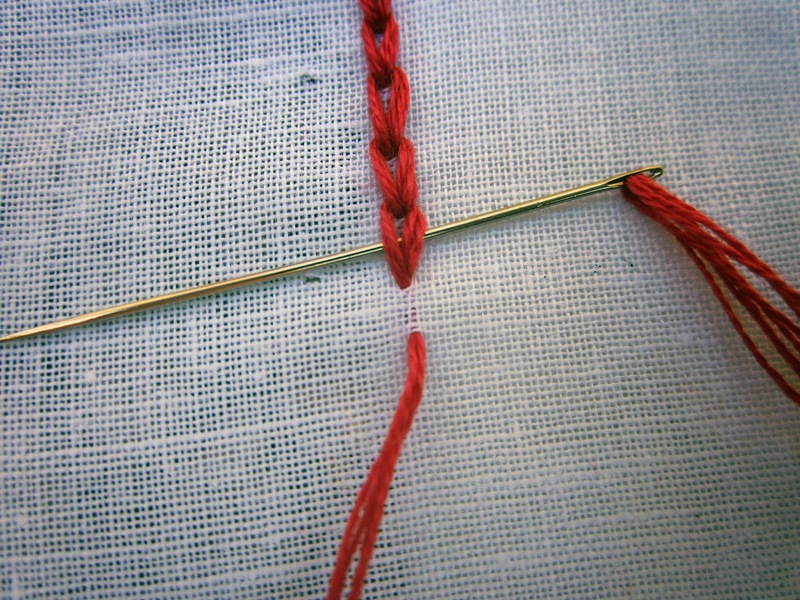 Begin with an anchor stitch. 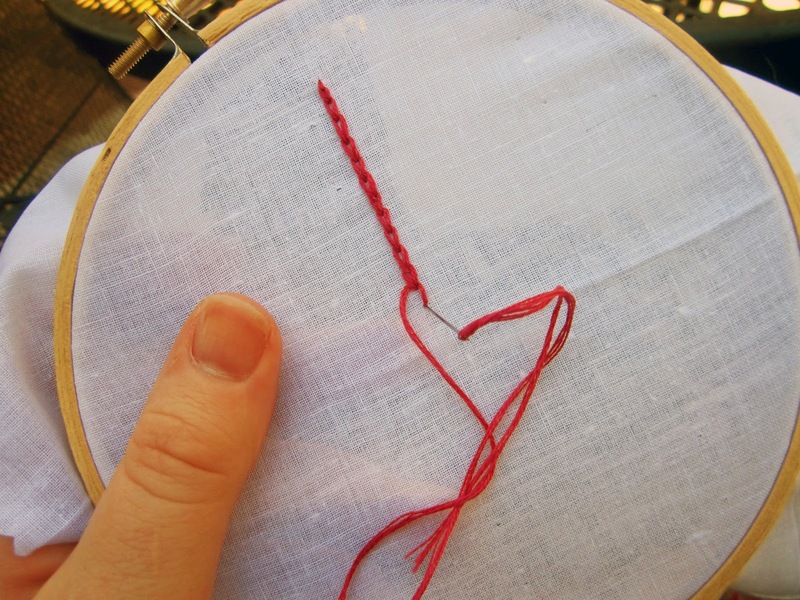 Come up with your thread at a point just below your anchor or previous stitch. Pass your needle and thread through the anchor stitch, pulling all the way through. Then insert your needle back into the same hole you started with. Repeat until you have a chain as long as you like! When your chain stitch is in place we’ll go back and add the back stitch. 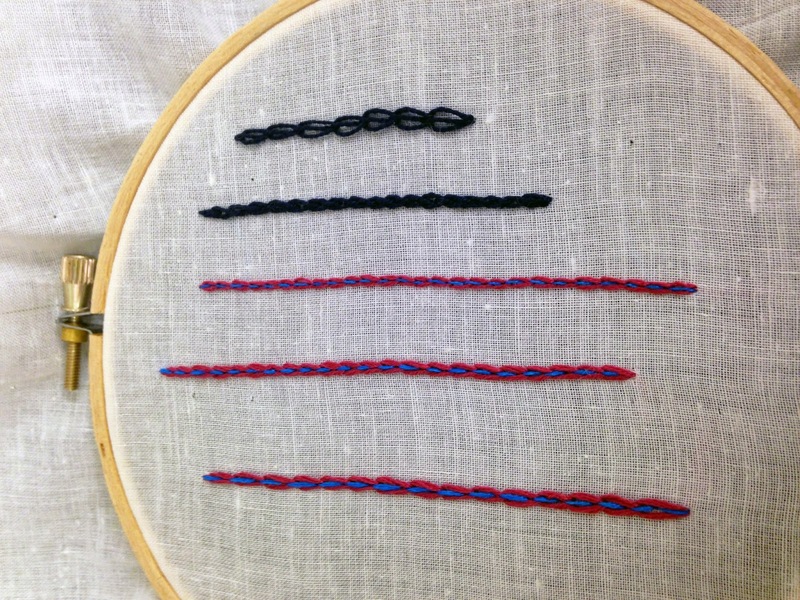 Begin by finding the end of your chain and come up with your needle just after the “hump” of our first chain stitch. Back stitch into the final stitch of the chain and pull all the way through. Come up again just over the chain stitch and back stitch into beginning of the previous stitch. Continue until you’ve backstitched through the whole thing. And that’s it! 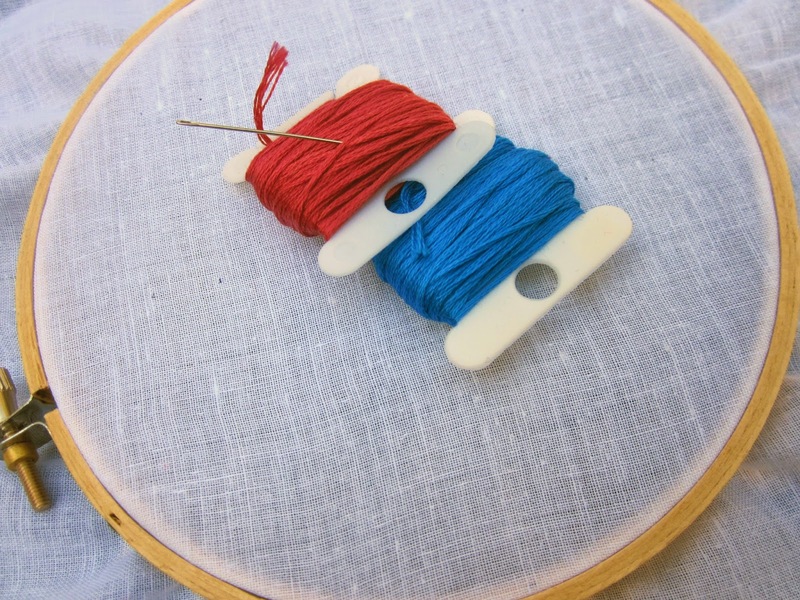 You can experiment with different color combinations, types of thread and even weight. In the picture above I used several different combinations and stitch sizes. From top to bottom: single strand perle cotton in fun, loose loops and another in small, tight stitches. The bottom three back to stranded floss, 2 strands of pink and one strand of blue. Then 4 strands of pink, 2 strands of blue and the bottom example is 4 strands of pink, 4 strands of blue. You can see how different this stitch looks in all these different forms, and I hope you feel inspired to add this fun texture to some of your embroidery! It would definitely make a great thick outline stitch, as well as be an interesting fill texture and sampler accent as well. I chose to use this stitch to lend some fun texture/color to a little hoop I made inspired by The Avett Brothers, who just wrapped up a three night concert stay in my hometown! I went back to my stranded floss and used an almost ombre color scheme. 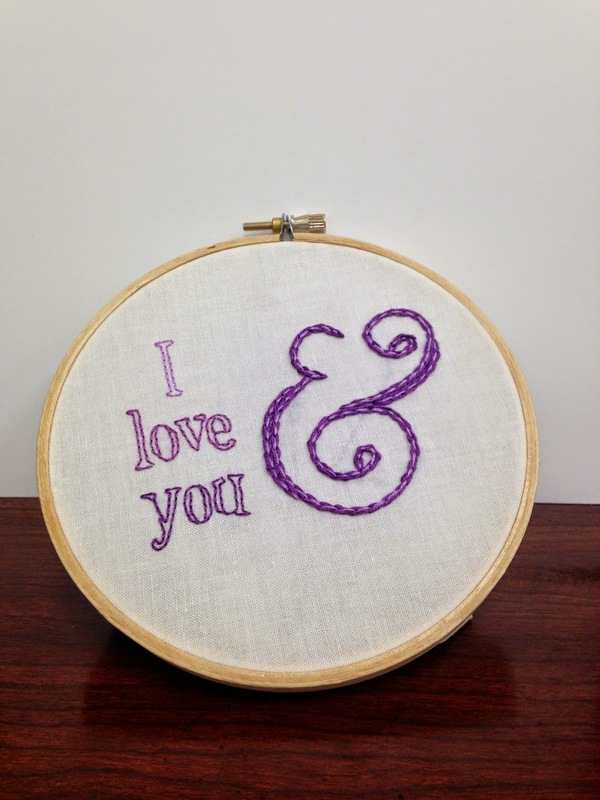 The ampersand is all done in our back stitched chain stitch, and the chain stitch lent itself nicely to all the curves on the fancy font. I also did some double rows to make parts of it thicker, so you can see how this would look worked side by side. Well, that’s it for this month. I hope you enjoyed learning with me! If you stitch something using the back stitched chain stitch, be sure to upload it to the Flickr pool so everyone can see! Be sure to leave me a note in the comments if you have any special stitch requests, or have any questions and I'll see you next time!